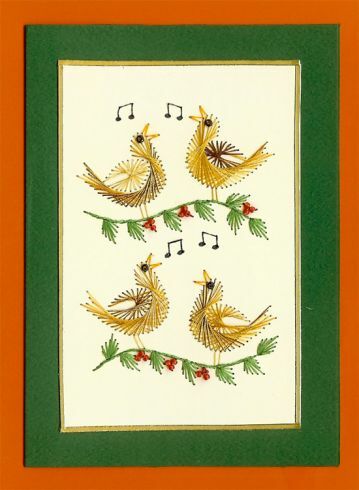 This week’s card is called Four Birds singing and was made by Jasu. This delightful card was made using the PinBroidery Four calling birds Pattern. Cards featured here must have been posted in either the Stitching Cards forum gallery or the Forum-A-Lines forum gallery. The card should be based on a Stitching Cards pattern or a Form-A-Lines pattern. This picture was posted in the Forum-A-Lines forum gallery. It is a beautiful card Jasu. I particularly like your choice of strong colours.